Get instant access to a comprehensive, personalized and real-time feed of regulatory content, all in one place. Sourced directly from regulatory agencies across multiple jurisdictions, thousands of content sources and industry focused news publications. Get a tailor-made snapshot of recent regulatory updates, prioritize your reading list, and use advanced search and filters to find what you need fast - without wasting hours sifting through Google or individual agency websites. Set email alerts that do the monitoring for you, ensuring you stay on top of key upcoming dates, developments, and deadlines - notifying you as it is published. Stay on top of violations, respondents, penalty amounts and other similar enforcement actions - without ever having to open a document. Reduce inbox clutter with an email digest of only the most relevant regulatory updates, approaching deadlines, and enforcement actions, summarized in one place, to save you time. From our free Basic edition, to our robust Pro and Team editions, Compliance.ai's solution scales to suit your regulatory change management needs. 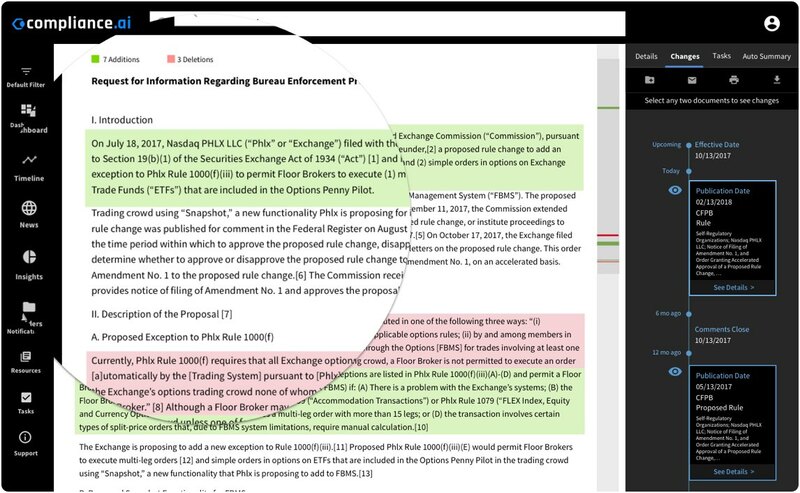 Compliance.ai automatically classifies, summarizes, and prioritizes regulatory content, so you can quickly identify the information you need and make decisions faster. Quickly gather what you need to know with dependable and interactive summaries, trend analysis, and key document information presented up front, powered by our unique Expert-in-the-loop, AI approach. 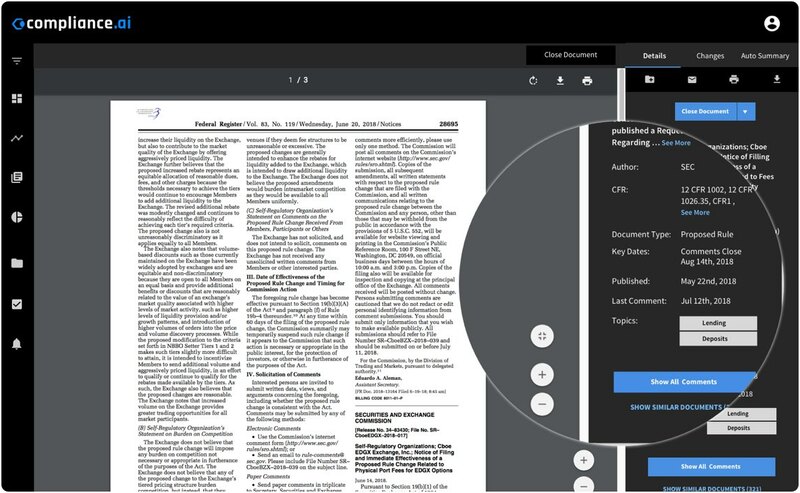 Instantly identify key differences between documents, including updates and revisions, when they occured, and whether they impact you. Replace the manual and expensive state comparison process with a tool that quickly contrasts how various financial concepts and products differ across jurisdictions by comparison metric and restrictions. Rapidly evaluate whether actions are required with an automatically summarized list of obligations for each regulatory document - no costly, time-consuming legal advice required. Replace disjointed, manual processes with one automated tool that allows you to manage team activities, workflows and seamlessly integrates into your existing GRC software. Simplify and streamline complex processes - and say goodbye to spreadsheets - with intelligent workflows, shared folders, and automatic task assignments based on new regulatory changes and deadlines. Monitor updates, delegate tasks, track notes and comments, and manage team activities - no email or spreadsheets required. Connect the dots between compliance activities, risk assessments and policy management with seamless integration into your existing software systems. 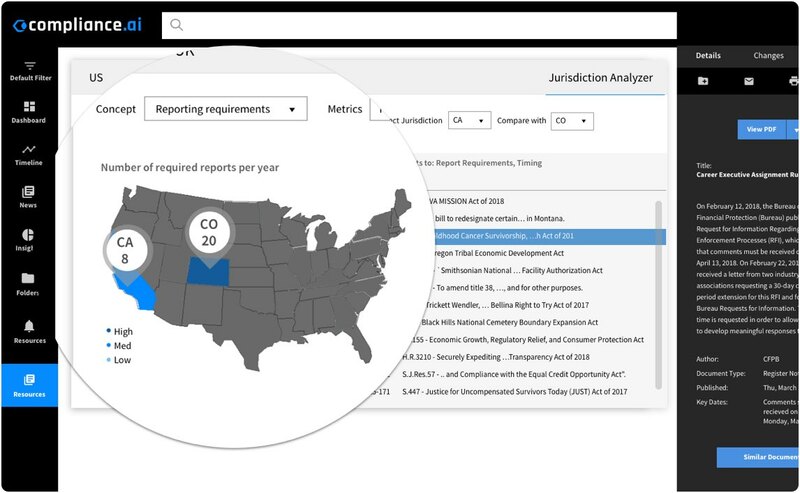 Increase transparency of compliance activities with key stakeholders, improve resource planning and make audits a breeze with automated, thorough, and accurate reporting. Relax knowing that tasks and activities are being tracked for you automatically. Get a detailed and accurate report of the steps you and your team took to respond. Gain visibility into tasks, priorities and workload across your team to more effectively allocate resources and budgeting. 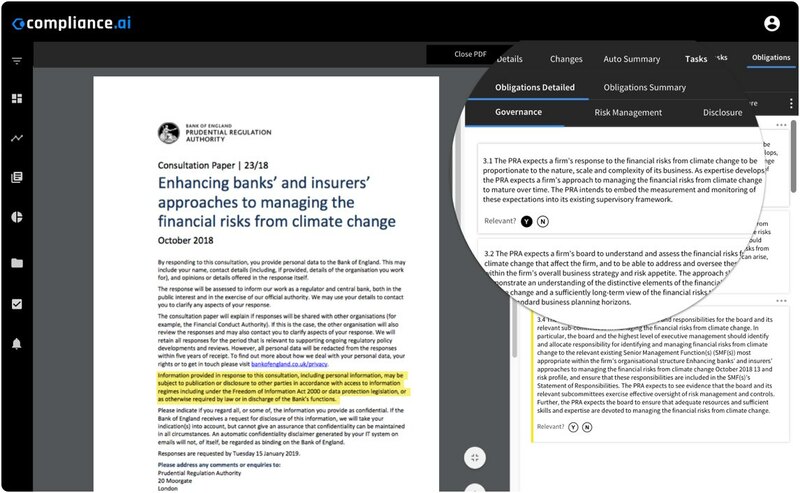 Quickly circulate reports, summaries, news, and regulatory updates to key internal stakeholders, so compliance activities are transparent and no longer happen in a silo. It's time to upgrade your regulatory change management process. Get the AI-powered platform designed for painless financial regulatory change management.